In the series, Josh Saviano plays the part of Paul Pfeiffer, Kevin's best friend. In the series, Josh Saviano plays the part of Paul Pfeiffer, Kevin's best friend. Josh Saviano was born in New York, USA on March 31, 1976. His first appearance in front of the camera had been the movie "The Wrong Guys" back in 1988, where he played a small role. 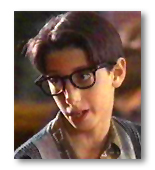 At the age of 12 he gained the part of Paul Pfeiffer in "The Wonder Years". Unfortunately, after the series, Josh retired from showbusiness. Since the year 2000, he works for an internet-company and is politically active. In "The Wonder Years", the jewish boy Paul Pfeiffer is Kevin's best friend. Both of them know each other for nearly a lifetime. Paul is allergic to almost everything, but he doesn't care much for that. He also has to cope with all the problems of a totally normal teenager. For example, over and over there are conflicts with Kevin or girls. • The character "Milhouse Van Houten" from "The Simpsons" can definitely be seen as a counterpart of Paul Pfeiffer, as both have lots of character traits in common. • Since the 90s, there is the rumor that Josh Saviano was the same person as the musician Marilyn Manson. This is not true! 1989 - The Ray Bradbury Theater"